I write this post with apologies to Paul King, from the excellent Kingwork Creative Blog. The other day I was messing around on Photoshop trying to create volcanic Dungeon,- ahem- *Adventure* Tiles. It was mostly an exercise in learning a bit more on Photoshop, while also designing something I wanted for my game. After posting a few samples, Paul King from the aforementioned blog offered to whip some tiles up, and he did, and they were great. But that didn’t stop me from still wanting to practice on Photoshop, so I kept at it. I am now offering them for download here, because there is a lack of free Lava tiles on the internet. I apologized to Paul, because he also made the set he created for me available for download, and I feel like I’m somewhat stepping on his feet. I hope it’s all good, Paul. So here is my set. Volcanic Hell Adventure Tiles. There, between Paul and myself, we just saved you a couple bucks. Enjoy. Awesome tiles! Great ps work! 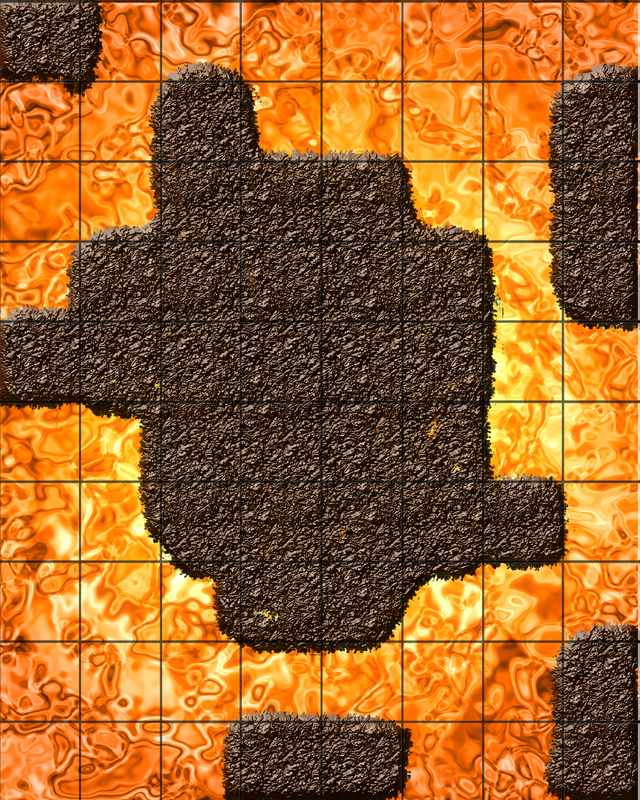 I just couldn’t resist to create a few lava tiles in 6×6 when I saw that there was a shortage. You can never have to many different tiles to choose from. If you have another shortage of tiles, please yell, as making tiles and maps are about the most entertaining thing you can do, next to actually playing the game. These are great! I really need to find a place that will do lamination for cheap. Any ideas? Oops, I forgot to post a link to my version of the lava tiles, and how I made them. I’ve read the cartography posts and attempted to create some of my own stuff via GIMP, using the references on this website, and a couple other tips and tricks from other sources. I gotta say, it starts to feel like a whole other world to me. I’m absolutely computer stupid- despite growing up in the age and constantly using my computer for research/social networking. (I’m 25) Like I said, these tutorials are less help for me, and more aggravating. That being said- I wish wish wish, I knew how to make computer generated maps, without needing to learn how to first use computers :). I wish someone; DDI or perhaps a private developer would design a program for simpletons like me- a “paint between the lines” kind of graphic map-maker. With generic “fill this square with lava” options, etc. I’m rambling. I guess I’m just envious. For now, I’ll stick to my future gameplan, scan my Dungeon Tiles, Print them, and create pre-planned dungeon rooms using black posterboard and countless chunks of styrofoam for elevations. Maybe I’ll post pictures someday, when I actually get a campaign running. @Dan Burnett:Take a look at Dundjinni (http://www.dundjinni.com), it is just that, click and draw, I use it for mapmaiking and tilemaking as one of my many tools. Is it printing larger or smaller? There is an option when you print from acrobat, that says something like “resize to fit”or something like that. You don’t want it to resize. They are 1″… you can center it if you’d like… but not resize. @Dan Burnett: I don’t know where in the world you are, so I do not know if you are using US Letter or European A4 papers. But, as the maps are 10″x8″, they wont print on A4, which is narrower (7 1/2″ wide or about 20 cm ). When I cut maps, I always do them 10″x7″, so they can print on every paper without having to rescale. This is also a huge problem when printing commercial PDF-advetures in Europe, that have 10×8 battle maps. Follow the NewbieDM on Twitter! 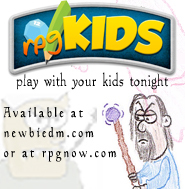 2,520,788 new DM's have visited newbiedm.com!